With The Paris Agreement at COP21 marking a turning point in the response to climate change, it is time now to consider how we will meet those targets in Ireland. In anticipation of the enactment of the Climate Action and Low Carbon Development Bill (which is expected shortly), the Department of the Environment, Community and Local Government (DECLG is currently preparing the National Mitigation Plan (NMP), a national plan setting out Ireland’s first statutory low carbon development strategy for the period to 2050. The plan will focus on reducing emissions nationally, but in order to ensure it is tailored to the needs of Ireland as a whole, it is important to highlight the issues from a rural perspective, in terms of current emissions and possible or likely mitigation measures as they affect rural dwellers. The WDC remit covers a largely rural region which takes in some of the most remote parts of the state. Over 40% of the population (68% in the WDC region) live in rural areas and smaller settlements. The top 5 most rural counties in Ireland are in the Western Region (Leitrim (89.6%), Galway county (77.4%), Roscommon (74%), Donegal (72.5%) and Mayo (71%)). The Western Region also has a higher share of the population living in smaller towns. The focus of much WDC policy work is on rural areas and their needs when these may not have been considered in detail in policy making. There is no significant body of work (internationally as well as nationally) on climate change and emissions issues for rural areas in developed countries and yet there are important differences in energy use patterns and emissions. While it is often acknowledged that rural dwellers have higher individual emissions the ways of addressing these are not usually explored, partly because emissions reductions may be more difficult to achieve in rural areas and partly because the focus is usually on larger populations and ways to reduce the emissions of individuals living in more densely populated areas. It should be remembered that, as in other policy areas, urban/rural is a rather simplistic division, which ignores the ‘suburban’ and the differences between rural towns and the open countryside which all have distinctive emission patterns. It is also important to be aware that people’s carbon footprints are closely linked to their incomes and consumption patterns and so do not necessarily relate directly to their location (urban or rural). In fact recent research in Finland has highlighted higher emissions from urban dwellers based on their higher consumptions patterns. Nonetheless, despite the difficulties with a simple urban/rural dichotomy, there are of course concerns specific to rural dwellers emissions that deserve consideration. In this post data from the Western Region, which is predominantly rural, is used to examine the issues. Electricity, heat and transport are the three forms of energy use and therefore the source of emissions, for residential and commercial users and so different urban and rural use patterns are considered. Before discussing these individually, it should be remembered that the a first step in tackling climate change should be to increase energy efficiency and so reduce the amount of energy being used (in both transport and heating) bearing in mind that improved energy efficiency will contribute to improved comfort and health outcomes in many situations, as well as reducing energy use, and that the energy savings from improved efficiency measures may not be as large as expected. There are not likely to be any significant differences among urban and rural dwellers in the type and way they use their electricity and in the associated emissions, but there are significant differences in heating and transport patterns. However, while patterns of electricity use may not differ significantly, developments in electricity generation and storage which reduce or eliminate carbon emissions from generation should, by 2050, have significant benefits for the heating sector and also, significantly, in personal transport with increased use of electric vehicles. Rural areas have a higher proportion of single dwellings rather than apartments, terraces or semi-detached housing and the lack of shared walls will tend to give rise to higher heating needs. Indeed, the CSO has noted in relation to the Buildings Energy Rating data (BER) that areas with higher proportions of new dwellings and of apartments tend to have higher ratings. For example, 40% of all dwellings built during 2010-2015 with a BER rating were awarded an A. They also show that mid-floor apartments are more energy efficient and 29% of all mid-floor apartments have an A or B BER rating. Single dwellings perform less well with only 11% of all BER rated detached houses receiving an A or B rating. Not all houses have been subject to rating and it should be noted that only 12% of all dwellings assessed so far have gained A or B ratings . It is often assumed that the housing stock in rural areas is older (and therefore less efficient and built to lower insulation standards, this can again be seen in the BER data), and indeed this was the pattern in the past, and is the case in many other countries. However, the building boom that occurred after the turn of the century has changed this. 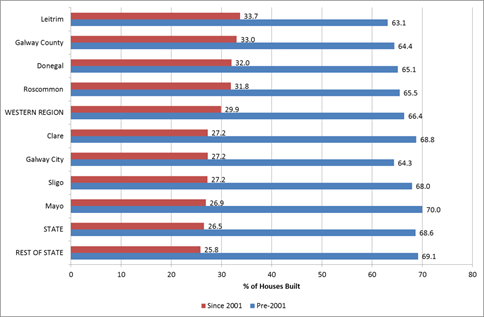 In the Western Region, 29.9% of all occupied homes have been built since 2001. This is greater than the proportion in the rest of the state and the share of newer homes in all western counties was higher than average. The total stock of housing in the Western Region increased by 14.9% since 2006, greater than the increase in the rest of the state (12.2%). The pattern of fuel usage in central heating is very different in the Western Region and the rest of the state (Figure 2). This is primarily due to the lack of access to natural gas across most of the region. Less than 5% of households in the Western Region use natural gas to heat their home compared with 40% in the rest of the state. It is likely that, low as this figure is, that it actually overestimates natural gas usage in the Western Region as a number of households in counties where no natural gas is available stated that they used natural gas. It is likely that these households actually use LPG (which also has lower emissions than oil). 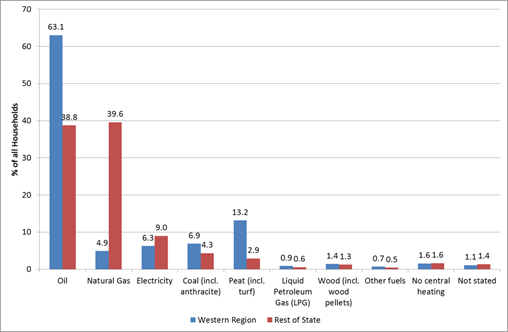 Lack of access to natural gas makes the Western Region far more reliant on other fuels, many which have higher carbon emissions. Oil is used by 63.1% of households, 13.2% use peat and 6.9% use coal – all far higher shares than in the rest of the state- and 1.4% of households in the region use wood (including pellets) in their central heating, marginally higher than in the rest of the state. The heavy reliance on peat in Roscommon and Galway County also stands out, indeed Roscommon has the second highest use of peat of all counties. While we have considered the fuel usage in the Western Region as a whole there are also urban/rural differences in fuel usage. In the Western Region peat is used to power central heating in almost a fifth of all rural households, but only by 3% of urban households. Electricity meanwhile is far more common in urban areas. Given its availability natural gas is also far more common in urban areas, being used by 11.4% of urban households but only 1.2% of rural. Oil however is the dominant fuel source for both urban and rural households. Alternatives to higher emitting fuels like oil, coal and peat are readily available to rural consumers. These include solid biomass (wood chips, pellets and logs). In many rural situations as users have more space and fuel can be sourced locally with less transport required, so these options may be more suitable than for urban dwellers. Uptake could be improved with appropriate, targeted incentives. Additionally, as the electricity generation decarbonises then electricity for heat will be another important option. At the same time as electricity storage methods (like batteries) develop further the options for storing energy from variable sources like wind, both at micro and network level, and improve possibilities for carbon free heating. There is significant future potential for low carbon and renewable heat in rural areas, and so for reducing emissions, but it should also remember than rural dwellers tend to have lower incomes than urban dwellers and already have higher levels of fuel poverty, so that despite the potential for change, many lack the financial resources to switch to low carbon or carbon free alternatives. This needs to be considered in formulation of policies addressing the issue. Rural people are more reliant on car based transport, they have less available public transport and tend to travel greater distances and clearly rural dwellers’ transport demand patterns need to be central to planning for climate change mitigation. There must be detailed consideration of transport issues for smaller settlements and rural areas which currently account for 48% of all trips (compared with 32% for the four main cities). The majority of the population will continue to live in the historical settlement pattern and spatial planning will not change that pattern significantly even in the long term (to 2050). Thus a National Mitigation Plan needs to focus on current spatial patterns as well as any future growth in demand. In Ireland, a very high proportion of transport emissions are associated with rural and long-distance commuting. Analysis of travel and car ownership data conducted by NESC for “Towards a New National Climate Policy”  highlights that Dublin accounts for approximately 28 per cent of the population (in 2006) and 26 per cent of cars (2010). It notes that Dublin drivers make shorter journeys, on average just under 13,000km per year, while in other parts of the country drivers travel on average 18,000km per year and NESC calculated that emissions from Dublin drivers are 948,153 Mt CO2 eq and from drivers elsewhere are 3,719,868 Mt CO2 eq. These estimates are based on kilometres driven and so do not take account of fuel use per kilometre travelled. NESC suggests that it in order to address the challenge of reducing emissions in Ireland there should be a focus on solutions that can address the needs of rural drivers and those making longer commutes to urban areas. In addressing this issue it is important to consider the underlying presumption that employment will be concentrated in cities. There are opportunities for employment to be more dispersed, in line with current population patterns. Towns, smaller centres and rural areas provide a variety of opportunities as locations for employment across many sectors (not just agri-food and tourism). Commuting travel demand, fuel use and time spent can also be reduced if employment is more dispersed, in line with current population patterns. In 2011 61% of rural dwellers (excluding farmers) worked in towns or rural areas illustrating the potential to stimulate employment closer to where people live (see note 8). Alongside these more dispersed employment opportunities there is significant potential to make the most of the opportunities provided by trends in technology development, the growth of services employment, a move to more varied working hours , and greater remote and home working opportunities as well as incentives for enterprises to offer different work arrangements (timing of day, tele-working). These trends will change the way people work and how often they actually travel for work. The National Mitigation Plan should recognise that active policies to encourage and facilitate new work practices can help manage and reduce future travel demand in a sustainable and cost effective way that also has quality of life benefits. But employment is only one factor generating trips. The 2009 National Travel Surveys showed that 70% of all trips are not related to employment. The importance of these non-work trips and the potential for change in this demand needs to be more central to climate change mitigation planning. It can be argued that better spatial planning with more concentration in population centres will provide more concentrated transport demand which can be better served by public transport with lower per capita emissions. However, in addition to planning for future development, there is a need to manage current and historic settlement patterns. People will continue to follow historic patterns and it should not be assumed that land use planning can radically alter Ireland’s historically dispersed settlement pattern, especially in the Western Region and other rural regions. When planning our national mitigation measures it will be important to consider both the impacts of proposed measures on rural dwellers and the rural economy. It is essential to ensure that there is a clear focus on rural dwellers in any plans so that our future climate change policy takes them into account, focuses on reducing their emissions and ensuring that the NMP and sectoral policies recognise the different emissions patterns of rural dwellers and provides for different mitigation responses.